Why do we keep having bad meetings? There are many mistakes that meeting leaders and meeting attendees allow which cause ineffective and nonproductive meetings. Ten of the most common mistakes are presented and easily solved using hints from the book "R.A!R.A! A Meeting Wizard's Approach" by Shirley Fine Lee (now available on http://www.Amazon.com). Have you been to a meeting lately that was ineffective and left you feeling like you just wasted time? Shirley Fine Lee, author of "R.A!R.A! A Meeting Wizard's Approach", offers a top ten list of reasons why many meetings go wrong. "Many of us have been to meetings where things got out of control and/or our objectives for holding the meeting were not met," Lee said. "We felt the time in those meetings was greatly wasted and wondered what went wrong. Some of us have even been the leaders at such meetings." 1. The meeting leader does not understand the role of facilitator. 2. The recorder role is under appreciated. 3. The leader does not have a written agenda. 4. If they have an agenda, they allow random changes. 5. The agenda does not have times assigned to each topic. 6. Records of meeting are not visible during meeting. 7. Records of meeting are not distributed afterwards. 8. Actions are not recorded during meeting. 9. Actions are not assigned to people before meeting ends. 10. Deadlines are not assigned to actions. Now let's evaluate each of those mistakes, according to Shirley Fine Lee's book "R.A!R.A! A Meeting Wizard's Approach". R.A!R.A! is an acronym for Roles, Agenda, Records, and Actions, which are key elements to successful meetings according to the book. A facilitator is responsible for insuring that an agenda is set and meeting processes are agreed to by the meeting members and then adhered to throughout the meeting time. Just having scheduled meeting time and an agenda won't insure accomplishing the meeting objective unless someone assumes the role of facilitator. If there is not a trained facilitator at the meeting, the meeting leader must understand and accept this role in order to have a successful meeting. The recorder is not only responsible for compiling the results of the meeting by taking meeting minutes, but also for publishing and distributing them in a timely manner to all meeting members in order for them to take appropriate actions. The recorder must not only capture decisions but data and discussion that lead to the decisions. Also, the recorder is often responsible for sending meeting reminders if a follow-up meeting is required. Some meeting leaders feel that their meetings are short or specialized and therefore do not require a formal agenda. However, they may discover that by not providing their proposed agenda at the beginning of the meeting, they quickly get off-track and lose control of the meeting. Some meeting leaders understand the importance of starting with an agenda, but don't always stick to it. In other words, they let others come into the meeting and change the agenda at any time by allowing them to talk out of turn or letting them change topics while discussing an agenda item. Although it may sometimes be better to change an agenda to cover urgent items, this should be done at the beginning of the meeting with the agreement of all present. It may not seem important to some meeting leaders to have times assigned to the topics on an agenda. However, they will find that having times assigned helps insure the meeting stays on track, that all the important topics get covered, and that the meeting starts and stops on time. The important and urgent items should always be the first items on the agenda and should have a few extra minutes of time allotted for discussion. Besides an agenda, another way meeting leaders can keep their meeting on-track is to make sure all idea generation, decision-making, and other discussions get recorded in a way that is visible to all members while the meeting is going on. Having a visible record using marker boards or flip charts often keeps members from repeating themselves to make sure they are heard. It also helps to bring members back into focus on the current topic if someone begins to stray away from agreed upon subject. Many meeting leaders recognize the importance of taking meeting minutes to have a record of what went on. Yet, some of them do not think to make sure those minutes are distributed to attendees and other interested parties after the meeting has finished. Quickly distributing meeting records allows members of the group to correct mistakes they think were made in the records as well as serving as a reminder of decisions made or actions to complete. Often meeting leaders may wonder why they are having all these meetings and yet nothing seems to be getting done. This usually means that the facilitator or recorder missed recording an important action that came out of a group discussion. One way to remedy this is to have a place where all actions are listed as they come up. Even if the facilitator or recorder misses the action during discussion, one of the meeting members will likely recommend it be added to the list. Now that meeting leaders know it is important to record all the actions, the next logical step would be to make sure someone volunteers to complete the action or is assigned the action. It does not accomplish anything outside of the meeting if you know an action needs to be done unless someone is planning to complete the action. The meeting leader should use the last few minutes of each meeting to assign any open actions and prepare a tentative agenda for the next meeting. Although most people in business have heard of the 3W rule for actions not everyone follows it. The three W's are: What is the action, Who will complete it, and When will it be done by. Having a deadline encourages people to get things done in order to keep the project moving and not disappoint the group. The actions should be placed in the meeting records so everyone knows where to look for them to begin doing the work required. Thus we have moved to solving the ten mistakes meeting leaders make using the R.A!R.A! concept. Although Roles, Agenda, Records, and Actions are the backbone of Shirley Fine Lee's book "R.A!R.A! A Meeting Wizard's Approach", there is more in the book. The author also includes sections on preparing for meetings and how to handle disruptions in the meeting. The book includes various forms for planning, recording, and evaluating meetings as well. Find this new book on http://www.Amazon.com. R.A!R.A! A Meeting Wizard's Approach ISBN 1-4196-5367-9Image of Book Cover from "R.A!R.A! 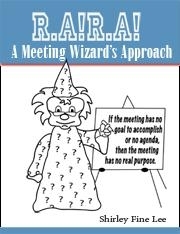 A Meeting Wizard's Approach" on Amazon.com ISBN 1-4196-5367-9 Information on R.A!R.A! A Meeting Wizard's ApproachFlyer on Book "R.A!R.A! A Meeting Wizard's Approach" that includes endorsements from book's back cover and information on the author. Book Reviews on R.A!R.A! A Meeting Wizard's ApproachSample Book Reviews on "R.A!R.A! A Meeting Wizard's Approach" for use in print and electronic publications.